The Auburn Tigers aren’t just hot on the basketball court. Auburn’s creative content team has raised its game to match the Tigers’ historic run to the NCAA Tournament’s Final Four and achieve massive audience growth for both the team and its players on social media. Since March 20 — the day before Auburn’s opening-round win over New Mexico State — Auburn’s Twitter and Instagram accounts have seen substantial growth. The Tigers’ men’s basketball Twitter account had reached 56,173 followers as of April 2, up from 49,972 before the tournament — an increase of 12.4 percent. On Instagram, the numbers were even more pronounced. Auburn’s official men’s basketball IG account had 41,633 followers on March 20. By April 2, that total had reached 58,839 — a jump of 41.3 percent. 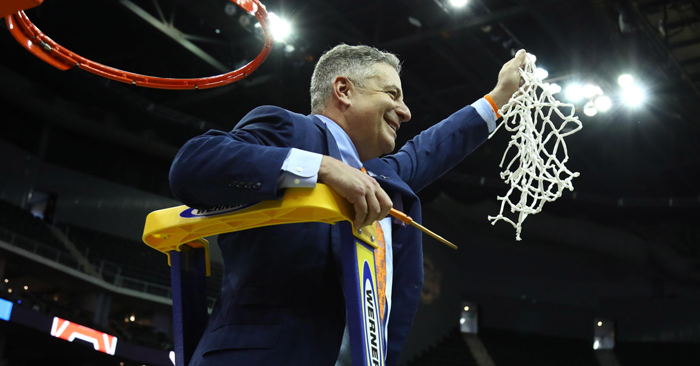 Auburn’s social accounts such as Twitter and Instagram have captured the spirit of the Tigers’ ride through an unbeaten March that includes the school’s first SEC Tournament title since 1985 and NCAA Tournament upsets of Kansas, North Carolina and Kentucky in succession. 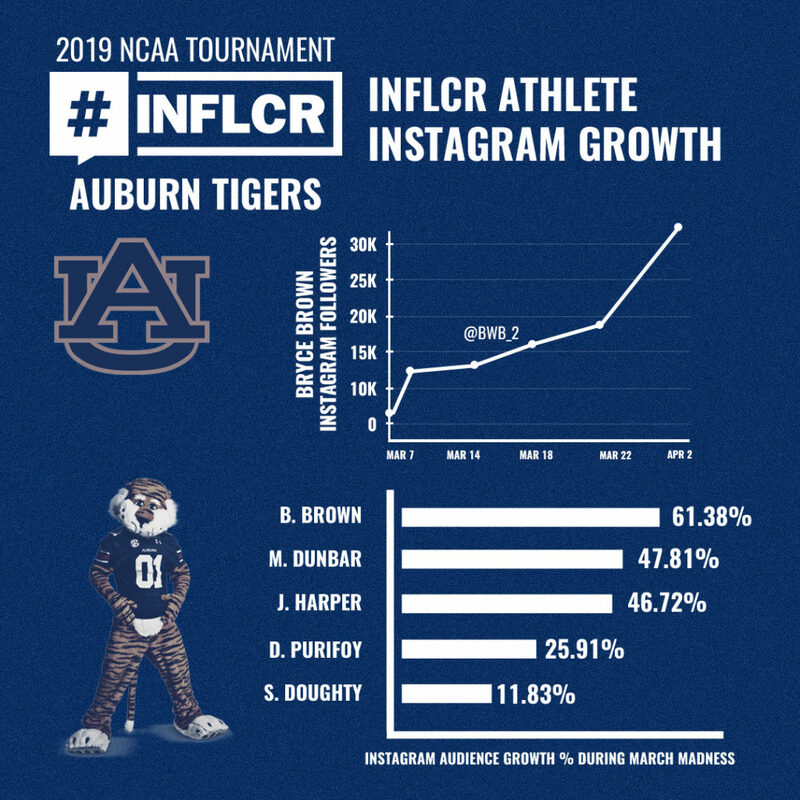 As a result of the tournament, Auburn’s players experienced tremendous growth of their personal followings on Instagram as the team advanced each round. No player was more prolific — or reaped more rewards in terms of followers — than Tigers guard Bryce Brown. He grew his following on IG from 13,700 on March 5 to 30,500 by April 2, a boost of more than 122 percent. Since the start of the season, his following has grown a whopping 300 percent. “Getting to know some of these guys, especially Bryce Brown, and seeing how much he has embraced social media and how much it has paid off for his brand is really what makes me and my team tick at INFLCR,” INFLCR CEO Jim Cavale said. 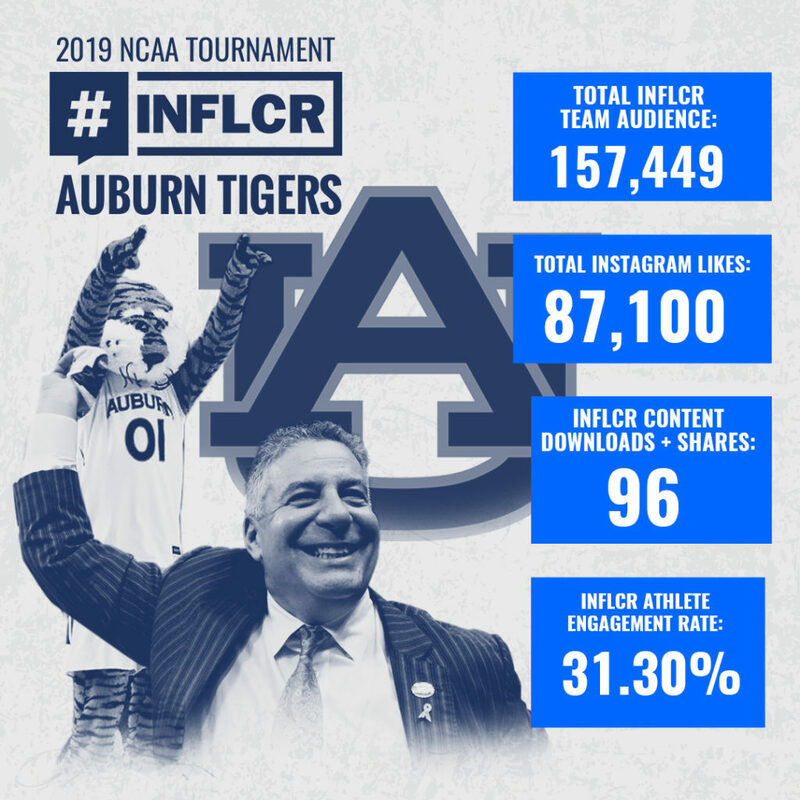 Auburn’s digital strategy throughout has also included the use of Influencer (INFLCR), the content-delivery system that lets the university’s creative team store and distribute its digital content to its network of student-athletes, coaches, alumni and other brand ambassadors. Auburn can then track the performance of that content as players and others share it across their personal social accounts. Working together, they reach a significantly larger audience while also helping the players tell their own stories and grown their personal brands on social media within the context of the team. “It’s why we do what we do. We exist to serve storytellers, and Auburn is literally in 18 months the perfect story of how to use our platform to grow your brand, protect your brand and recruit your brand, and ultimately be ready for a moment your brand has never experienced before,” said Cavale. Auburn is one of more than 20 NCAA Tournament teams that used INFLCR to reach a collective audience of millions during the tournament, including four of the Elite Eight squads and two that advanced to the Final Four. “Since the beginning of INFLCR, one of the main things that I continue to preach to all users, whether they are athletes, staff or coaches, is to be ready for the moment,” said Cavale, one of the country’s leading experts on personal branding. “The teams work so hard all offseason, they practice and play so hard during the season to get to a big moment for the history of their program or reach a big goal. “To be ready for it with their digital and social brand is so important. … So many people just aren’t ready for a moment like Auburn Basketball experienced this past weekend, when for the first time in the history of their program, they made it to the Final Four. What an amazing accomplishment. You know what, they were ready.